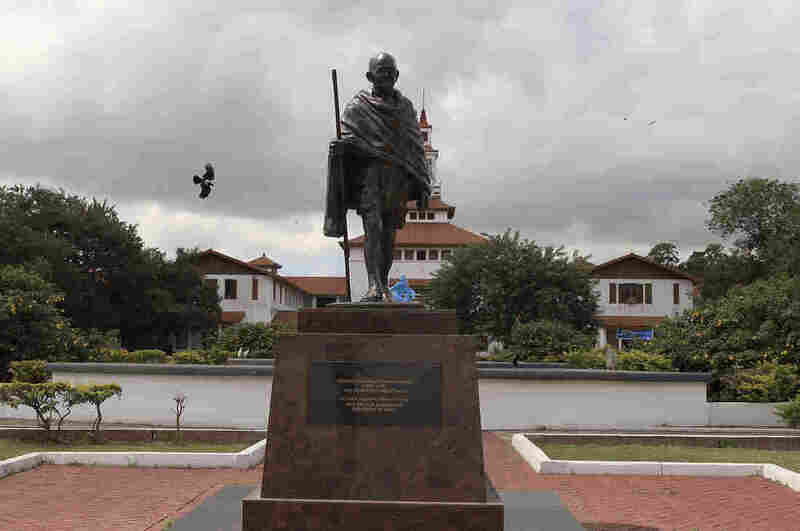 Ghana Wants To Remove Statue Of Gandhi Over Racism Controversy : The Two-Way Professors campaigned to have the statue at the University of Ghana removed over Mohandas Gandhi's "racist identity." Now the Ministry of Foreign Affairs says it wants to move it — for its protection. The statue of Indian independence leader Mohandas Gandhi in Accra, Ghana. After professors at the University of Ghana demanded the removal of a statue of Mohandas Gandhi over what their petition called his "racist identity," Ghana's Ministry of Foreign Affairs says it wants to "relocate" the statue — to protect it. The iconic Indian civil rights leader has inspired peaceful protest movements worldwide, including in many African countries. But in the petition, the University of Ghana professors point to comments Gandhi made early in his career. "How will the historian teach and explain that Gandhi was uncharitable in his attitude towards the Black race and see that we're glorifying him by erecting a statue on our campus?" the petition reads. The statue was unveiled in June by Indian President Shri Pranab Mukherjee during a state visit to Ghana, and professors began rallying against it in September. In a statement, Ghana's Ministry of Foreign Affairs said it was following the controversy with "deep concern," and added: "While acknowledging that human as he was, Mahatma Gandhi may have had his flaws, we must remember that people evolve. He inspired movements for civil rights and freedom across the world." The ministry stressed that the "unfortunate verbal attack" against Gandhi could potentially "create disaffection not only at the level of Government relations, but also between people not only in our country but all over the world." Therefore, the ministry said it wants to move the statue to "ensure its safety and to avoid the controversy ... being a distraction of our strong ties of friendship that has existed over the years." Gandhi "has long been a more controversial figure, both in his homeland and elsewhere, than many admirers around the world are aware," as The Guardian writes. "A general belief seems to prevail in the Colony that the Indians are little better, if at all, than the savages or the Natives of Africa. Even the children are taught to believe in that manner, with the result that the Indian is being dragged down to the position of a raw Kaffir." "Kaffir" is a slur against black people, particularly in South Africa. Reuters reports that Jad Adams, the author of the book Gandhi: the True Man Behind Modern India, says Gandhi "later seems to have changed his views, saying stereotypes of Africans as 'barbarians' are wrong." Gandhi spent two decades in South Africa "fighting to expand rights for Indians there," The Associated Press reports. It adds that "Gandhi's approach to nonviolent protest influenced the African National Congress and its resistance to white minority rule." There is no official confirmation that the statue at the University of Ghana will be removed. The professors wrote in the petition that they want to see "African heroes and heroines" honored on campus instead. "Why should we uplift other people's 'heroes' at an African university when we haven't lifted up our own?" they ask. A previous version of this story misspelled Shri Pranab Mukherjee's name as Shri Prenab Mukhereje.